Sometimes an object becomes so special that it just deserves its own special tribute. This is actually three objects, all of the same design. In 1992 Linda and I went to the Melbourne Cup, Australia’s equivalent of Ascot. While there I bought two identical, expensive white shirts made of Indian khadi (handspun, handwoven fabric, lionised by Gandhi as the quintessential, noble item of Indian cottage industry.) What brilliant shirts! Loosely woven, cool in the hottest weather. I loved them. Fast forward 22 years. One has vanished, the other is looking decidedly frail. We are off to India when, almost at the last minute, I realise this is my chance to have them copied. Woohoo! Into the suitcase it goes. Darjeeling, March. Opposite my hotel is a little tailors’ shop – two men wielding ancient machines, with a third, foot-cranked one to cover for the frequent power outages. Tailoring in India is often a Muslim occupation, and I spot a calendar with Arabic writing on the wall. Putting my best foot forward, I greet them with ‘Salaam eleikum.’ Back comes ‘Eleikum salaam.’ A good start. They inspect the shirt. Yes, no problem. This is good news – the neck and yoke are, despite their apparent simplicity, clever and complex, the reason they sit so well. I want three. Yes, no problem. How much? 350 rupees – £3.50. I’m hardly likely to quibble. How much fabric? They measure, look at me, suggest they might be improved with a little more length, give me a number. Off I toddle to the Government of West Bengal khadi shop. Bizarre. In spite of Gandhiji’s emblematic khadi being, like mine, loosely woven and white, there isn’t a single length of white fabric in the shop. Down to the bazaar. Nope. Nobody sells white khadi, or anything that looks like it. One particularly friendly trader suggests that ‘Sa’ib might find this an acceptable choice’ and shows me incredibly fine, soft, white, almost transparent pure cotton fabric, doubled over on the roll, i.e. very wide. “Bed sheeting, Sa’ib.” It’s perfect. Because of the double width, he recalculates the amount needed. I huff and puff my way back up the mountain, gasping in the thin air, to the tailors. I’m not up for another climb. Living here in my 20s, even as a weed of a junkie just released from three months lying around on starvation rations in a Thai prison I never suffered from the altitude. Now, 65 years old and fit, it’s exhausting. He brightens; clearly thinks this a good idea. Two days later I pick up three shirts of the same design – one single weight, one double weight, and the skilfully repaired original, thrown in gratis. Three weeks later I am in Spain, walking the Camino de Santiago. What am I wearing? The double-weight shirt. It’s superb – soft but strong, warm in the sometimes chilly early spring, breathes better than any synthetic, dries quickly. But comes back with a blue stain across the back from my back-pack. I treat it with a product for whitening ladies’ underwear, which replaces the blue with a yellowish stain, which I treat with a good soak in bleach and voila! – a spotless white shirt again. This is not the shirt in the picture. That is the single-weight version. Back in England, in a heatwave, I walk in it, charging up hill and down dale at 7 km/hr, my daily regime since the Camino and the reason I have gone from a 38″ to a 34″ trouser size and from intermittent depression to persistent cheerfulness. It is once again a brilliant garment. 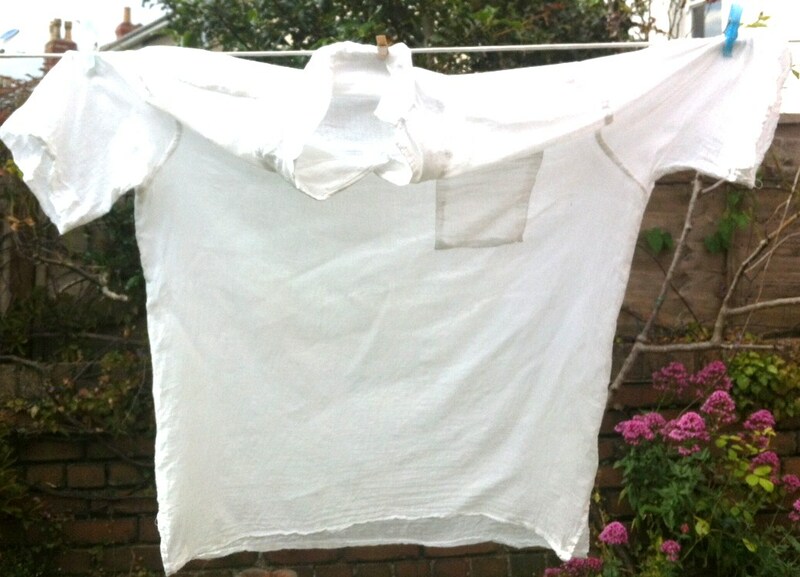 I can wash it, hand-wring it, hang it on the line for ten minutes and chuck it on again, its residual dampness dispelled by my body heat in minutes. What a complete, simple pleasure it is to have these shirts. No-one would look at them twice, but they are gorgeous, swimming with history, precious beyond rubies.